Today we have the pleasure of featuring author Ann Marie Stephens! 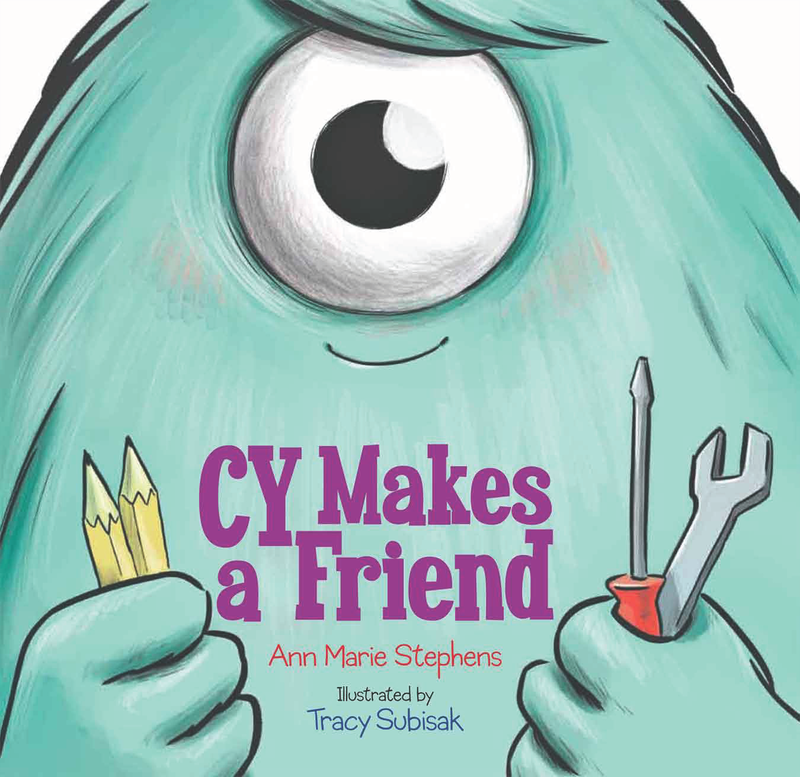 Ann Marie is giving away a copy of her picture book CY MAKES A FRIEND, illustrated by Traci Subisak (Boyds Mill Press, 2017) and some swag. Be sure to enter the Rafflecopter at the end of her interview! Writing was a natural choice for me. When I was in 5th grade, my teacher, Mrs. Ripol asked us to write a story and I wrote an ode to my dog that had just died. I read it aloud and got choked up. Mrs. Ripol got teary-eyed and the class was silent. I could tell my words had made an impact and that was such a cool feeling. I continued to write letters and poems to my parents and friends, and inconsistently kept a diary. I wrote a ton of love poems to boys I crushed on. I kept those to myself, thank goodness. When I started reading picture books as a teacher, I felt connected to them. They make me feel nostalgic and safe, and some of my favorites have a cozy element. Picture books are like a low-cost, unforgettable vacation for the brain. Kids are under so much pressure these days with too much homework, tests, technology, and more tests. They need outlets and adventure. I’m just one of the many travel agents, a.k.a. kid lit writers out there, ready to hand kids an escape. Congrats on your picture books. Can you tell us about them and what inspired you? Thank you! CY MAKES A FRIEND is a story about a Cyclops who can build and make amazing things but he can’t make a friend. He tries lots of strategies he thinks might win over a friend. In the end, he’s just himself and that’s enough. The idea came from my long time interest in Greek Mythology. As a young girl, I didn’t find myself wanting to learn more about the pretty and powerful goddesses. The evil monsters and the creepy underworld were what fascinated me. I thought it would be great to write a story about a Cyclops, but not a mean one who ate people. I wanted to create a one-eyed guy that would be so sweet he might even be irresistible. I wanted him to make a friend because that would be totally unexpected. It was also exciting to work with the theme of bravery. Putting yourself out into the world can be the hardest part about making new friends. If Cy with his one eye, swoopy bangs, and awkward tendencies can do it, anyone can. 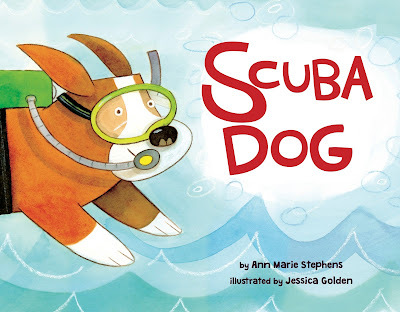 SCUBA DOG, illustrated by Jessica Golden (Little Bee Books 2016) is about a dog that loves swimming in the ocean. He meets a whale and realizes that if they are going to be friends, despite their differences, he must do something drastic. So he gets his scuba diving certification, and he and Whale become fast friends! A long time ago I saw a cartoon picture of a dog in scuba gear. I thought to myself, “What would a dog do underwater if he could stay down there long enough?” As a scuba diver, I find myself extremely comfortable underwater. Much more than I am on land! When I’m down there I meet all kinds of animals. I’m curious about them, they are curious about me. I even have videos of fish and sea turtles following me. I pretend they actually want to be my friend. See why I write for kids? But all dives must come to an end so I never really get the chance to form friendships. SCUBA DOG was my outlet for this. You have a couple new books, ARITHMECHICKS, coming out in 2019 and 2020. Tell us about those. ARITHMECHICKS ADD UP and ARITHMECHICKS TAKE AWAY come from my love of math. Bwahahaha! Just kidding. Anyone who knows me is well aware that I’m not a fan of math. But as a teacher, I am a fan of trying to find different ways to teach math. I thought it would be fun if I could have cute, fuzzy chicks doing addition and subtraction problems. There are ten chicks, plus their mama, which means lots of energy, cheeping, and adorability. Jia Liu will be illustrating. She brings mega personality and creativity to her work. I can’t wait to see her vision of my feathered babies. As a teacher of young children, you must be in touch with what kids like in picture books. What would you say are the keys to a successful picture book? The biggest draw for them is humor. It’s a consistent crowd pleaser. They tend to like a lower word count, though if a book is longer AND awesome, they will hang on every word. Creative front covers are always a bonus and standout main characters become subjects for spin-off books written by the kids. Books that have repetition and opportunities for participation are also popular. My students love sweet, heartfelt friendship stories too. Spend enough time with kids and they will practically hand you the keys to what makes a book successful. If anyone reading this wants to visit my classroom to do your own recon you are welcome anytime! When I started in this business, back in the late 90s it was not so great. I got an agent right away but we weren’t a good fit so we parted. After that I had to put in the hard work researching publishers, editors, and agents. I sold two books on my own, to a publisher that is now out of business after questionable acts and changing names over and over again. Now I refer to them as “They Who Must Not Be Named.” It was really disheartening. I never stopped writing though and I continued to attend SCBWI conferences (still do) and local SCBWI chapter workshops. Now I’m agented by the hilarious and brilliant, Emily Mitchell, at Wernick and Pratt Agency. I used to send my manuscripts to her, starting back in 2002, when she was an editor at Charlesbridge. Even as she rejected me she saw my potential. Over the years, she requested revisions and most importantly she kept asking to see more of my work. We even had a story that came close to a contract, though it didn’t make it past acquisitions. In 2012, she left the kid lit business and I was sad. Then in 2014, I was visiting her book blog and saw that she had reentered the publishing world as an agent. I queried her, sent her a handful of manuscripts, and she signed me. B.A. - Before Agent: There were times when I felt discouraged, as it seemed everyone around me was having success. (This still happens just not as often!) BUT... I was always writing, despite the rejections, though I didn’t share my work with as many publishers as I had been. I kept a lot of my stories from my writer friends too. So I guess my road to publication was full of potholes and hills, but also spectacular views and helpful signs, leading me to where I am now. This writing thing is really all about 3 P’s: Patience, Persistence, and People. That last one is crucial. Find people who write, who support, and who give gushy, make-you-feel-better hugs. You will always need them. Currently, I’m revising an old manuscript and busy brainstorming for a picture book I thought of back in 2016. Seems crazy that I’m just getting around to it, right? It’s pretty normal for my process. If I get a tenacious idea that keeps tugging at me, I will work on the story immediately. If I don’t hear the voice of my character or get the feel for the story, it sits in my journal until it’s ready to grow. Some stories end up going nowhere, others go to my writing friends, and then to my agent. Waiting to hear back about my work is a test of patience. Writing as often as possible helps me stay motivated and makes me have less time to obsessively check my email for word from my agent. What advice would give to aspiring authors? Read what you want to write. If you want to write picture books, read hundreds of them. If you want to write a YA novel, read as many as you can. Also, stop making excuses or waiting for more time. You will never get more time! I think we make excuses because writing is tough. It’s like a bumpy, upside-down, loopy roller coaster. Sometimes you raise your hands and scream with joy, other times you grip the bar in front of you like a scared kid. Writing involves total brain engagement, bouts of elation, and boo-hiss rejection. If you want to get published, you will make it happen. Because I teach full time, I have to be creative about when I write. I write in my head on my monotonous commute to work, then jot down my thoughts at the red lights. I write when I’m in boring meetings, long car rides, airport layovers, and of course, weekends, when possible. Don’t feel like you have to have hours each day. Use every minute you can. They will add up! Oh, I love this question. Thanks to my Uncle Bobby I have something cool to share. Bobby spent many years researching our ancestry on my mom’s side. He discovered that my great, great, great grandmother was a full blood, Cherokee, American Indian. Told you it was cool! It makes me feel really proud to be related to such resilient, brave, and resourceful people. They can find me on Facebook, Ann Marie Stephens (AMStephensAuthor), and on Instagram and Twitter @AMStephens_. I also co-blog for teachers at http://2happyteachers.blogspot.com. Thank for the great interview, Ann Marie. Congrats on your new release! Loved reading about your journey. I also taught 1st grade for many years. I think what I miss the most is all the group PB reading and those eager new readers who taught me much about what makes a good story! I'll be looking for your books! Always nice to meet a fellow first grade teacher! Enjoy the books! Poor cyclops! Maybe a good haircut would help! Ha! Thanks for reading the interview! Scuba Dog sounds like a fun book! I'd love to read about the cyclops. I was always interested in them too. Great piece with some good suggestions on what kids like to read or have read to them. Think I'll try one of them. So glad to hear your students love humor so much...I try to put that in each of my manuscripts because I love it so much too! It definitely works! Good luck! Thanks for the interview. I enjoyed learning from a teacher what kids like best in picture books. I know I enjoyed humor too--laughter just makes you feel better. So true! Thanks for reading the interview! These books look just like something my grandson would enjoy. I'm sure he would! *wink, wink* If you do share them with him please post pics! Thanks for reading the interview! These look like great books, excited to check them out! What an adorable monster! I'll be his friend. Aww, Cy loves new friends. Thanks for the comment. A wonderful interview.....what a neat geneology! Thanks for telling about your journey. Love hearing about your journey as a writer. Congrats on all your success! I've heard about patience and persistence, but I love that you added 'people' to the necessities. The kidlit community is awesome!